This includes revenue from ebooks, emagazines, and epapers. 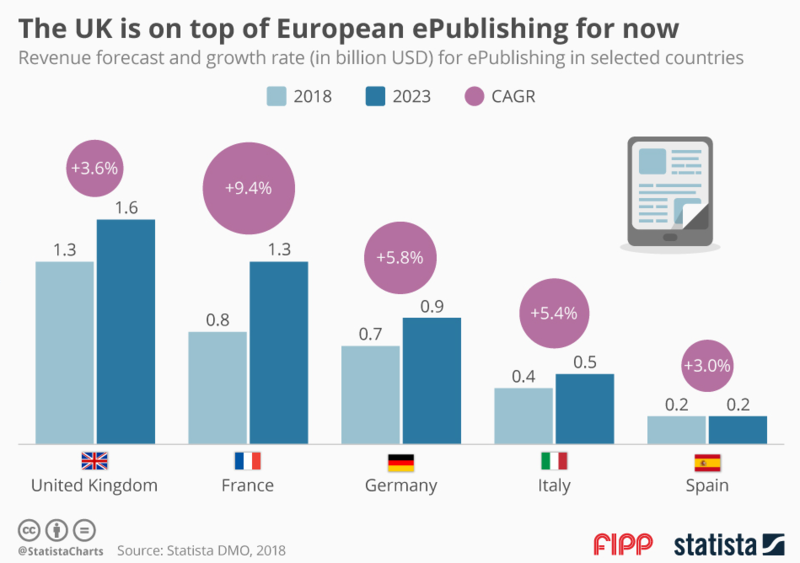 While the UK is one of the more established markets in Europe, France’s epublishing sector is expected to take off with a CAGR of nearly 10 per cent. For comparison the global revenue for the digital publishing market is expected to grow at a 6.1 per cent rate, putting France well above global revenue growth. As of 2018, France’s digital publishing market stood at $800 million, with that expected to pass the $1 billion mark within the next five years putting the country nearly on par with the UK. The UK epublishing market will need more purchase incentives to reinvigorate growth and prevent the market from stagnating. Broadly epublishing is defined as paid written editorial content distributed over the internet, which can be read either through specific devices, like Kindles, or through multi-purpose devices, like tablets, smartphones, or computers. Digital publishing is cost-efficient for publishers, allowing them to save on printing, logistics, and sales, while also democratizing the publication industry and opening the opportunity for more people to publish content on their own. Chart of the week: How can newspapers build trust?